The output power of the 2040 ranges from 20W to 40W, depending on output tube selection and measurement technique. The 2040 features three preset bias ranges and a plate voltage setting (Hi and Lo) so the player can choose a favorite tube type (octal only). 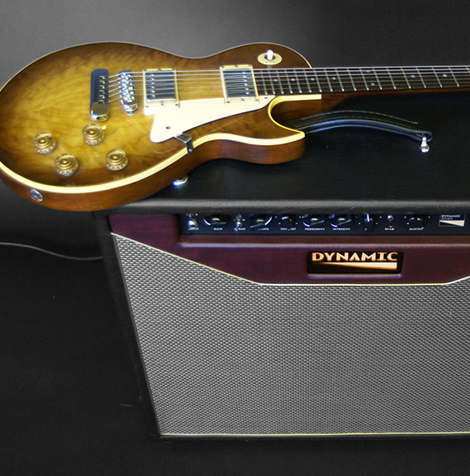 Factory bias settings are for 6V6, 6L6 and EL34, the most popular output pairs. Also, pre-biasing for 6550 and 5881 pairs is possible when ordering. Some amplifier brands also claim switch-ability, but in fixed bias design, typically chathode bias amps, but in our so-called fixed-bias design, we have provided external access to the three bias trim potentiometers, and meter probe sockets. This will allow intentional setting of bias voltage to the output tubes, to get the desired sound characteristics that slight over or under biasing produces. Note: The class designation of an amplifier’s design (A, AB, Single-Ended, etc.) or its bias type (cathode bias, fixed bias) is not the main determinant design parameter that characterizes a particular sound quality. It is an influencing factor, yes, but there are many others that individually or collectively are far more responsible for the amplifier’s sound. Output tube type is one of those very important characteristics, as is the particular tube’s internal construction, quality control, etc. This is apart from biasing technique, etc. At a summer barbecue cook-off, not all sauces taste the same and there is no good, better or best, only different. And you get to decide which is the best tasting to you. The same goes for output tubes, as long as the tubes in contention are not just re-branded versions of each other. If they are different structurally –and you can see that for yourself- they will sound different. The importance of this difference is up to the listener to decide. The Dynamic 2040 will allow for a great number of different tubes of a type, and several types to boot, all octal (8 pin) types. Some versions of the 6L6 will, when clipping, show a flattened top to the sine wave producing a harsher distortion, another will show curved top, meaning smoother sounding distortion. If variety is the spice of life, this amplifier provides the features and flexibility to allow you to “season” the sound to your taste. Two 6V6’s should put out a nominal 20+ Watts, more than enough power for most clubs, but in some bands, you might need more “headroom”, which means a higher output so you can get clean tones at a higher volume level, in which case 6L6’s, putting out a nominal 30+ Watts will provide that extra headroom. 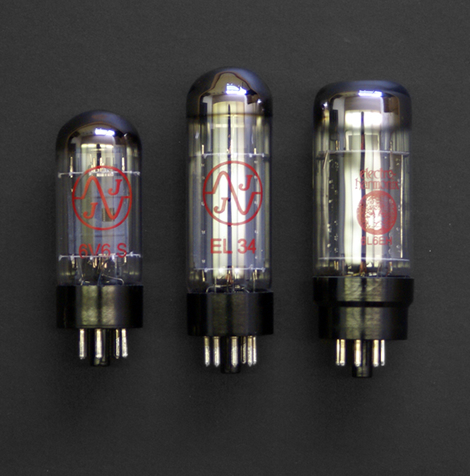 These are cleaner sounding up to a higher volume, where EL34’s or 5881’s will put out closer to 40 Watts, sound smoother when overdriven…and so it goes. For over a year, this amplifier has been to clubs, large and small, all over Michigan, and always felt more than adequately powered. The power amplifier section is where loudness is generated, but also where the dynamics the player creates playing the guitar is translated to the sound everyone hears. The output tube plays a part in this effect, where compression is evident as you hit the guitar hard, and where delicate tones come through clear as the proverbial bell. Even with the lower- powered 6V6 output tubes, this amplifier is very loud, dynamically expressive, and capable of cutting through the mix of a 6 piece band without reinforcement, even more so with the large, 2-12" cabinet. Having worked on countless classic American and British amplifiers, and fully enjoying qualities in both, we developed an amplifier that produces many of the qualities of each, while having a distinct character, a voice of its own. Play the guitar gently will yield clear, chimey, bell tones, that played with a good guitar will ring much longer than expected. The sound difference between a new set of strings and an old set becomes more like changing guitars. There is a clarity to the tones both in the low-end as well as the top, that is very unusual in the world of guitar amps. Even chunky chords cannot mask the individual notes that make the chord. Dig into the guitar with enthusiasm and the player is rewarded with much the same clarity, only louder and “hairy”, with smooth, vibrant distortion. Back off the guitar volume or the attack, and the sound cleans up nicely. Typical gain-sapping tone stack designs were avoided. We opted instead for a simple tone control coupled to a defeatable midrange contour selector switch that gives control over tone, while keeping tone quality and gain structure largely intact. Carefully choosing the ratio of gain to master to suit the room, will allow even single coil guitars to have the bloom of natural output stage compression, coupled with distortion, to create full and vibrant chords that ring and chime. You will play more. A Division of DMT, Inc.